Frank Sanderell, double bass, studied with Klaus Stoll at the Hochschule der Künste in Berlin. His great passion has always been ensemble music. As a student he was already performing as an extra player within the Berlin Philharmonic Orchestra and the Sinfonieorchester des Bayerischen Rundfunks. He was a founding member of the Berliner Kammerorchester and the Ensemble Oriol Berlin. Having completed his studies, he was engaged as the principal double bass player of the Württembergischen Kammerorchester Heilbronn under the direction of Jörg Faerber, where he also gave his debut as soloist. 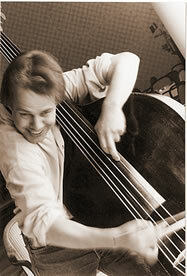 In 1993 Sanderell moved to Zurich to become the principal double bass player of the Tonhalle Orchester. He has also been on the teaching faculty of the Musikhochschule in Zurich since 1998. Forever committed to expanding the range of repertoire, in addition to his classical chamber music and solo activities, he performs many different styles including Rumanian folk or contemporary experimental music and is a member of a Tango quintet.